What is the Eagle Color-Thon? The Eagle Color-Thon is a fun, healthy way to raise money for our PTF organization to help purchase a new school transit. 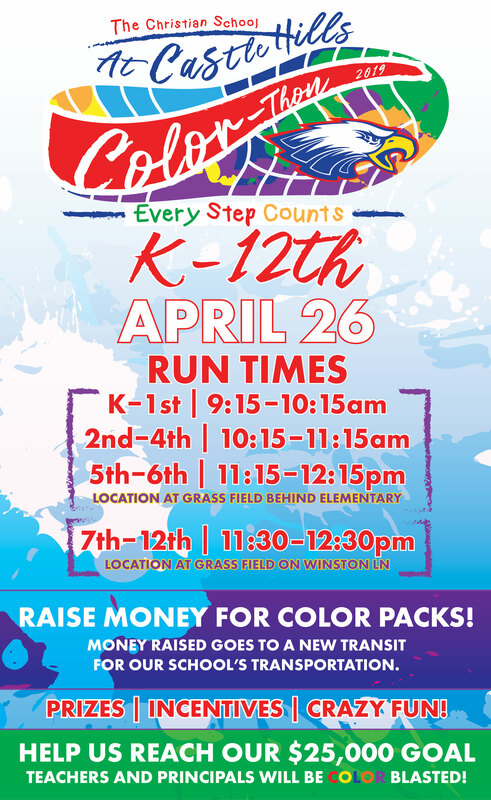 The Eagle Color-Thon is a Walk-A-Thon type event where each student will request donations for walking or running laps. What do you mean by "Color"? This is the really fun part! 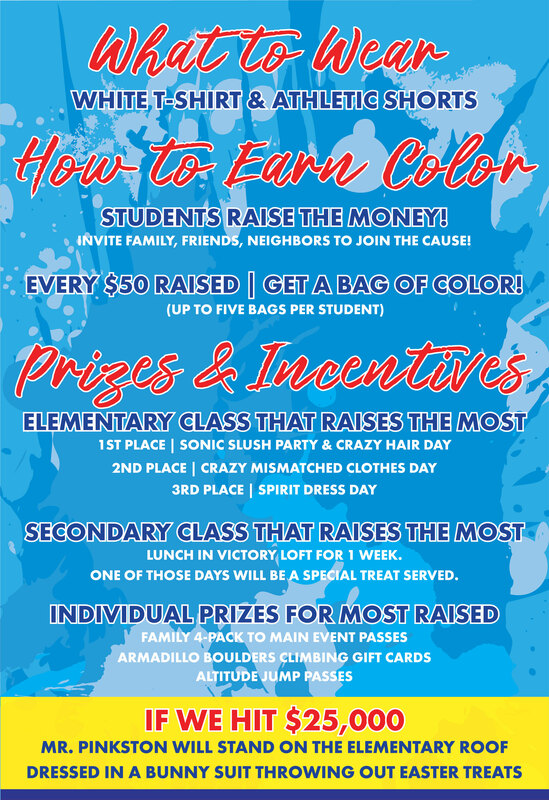 For every $50 in donations a student raises, he/she will earn a package of color powder that will be used to throw on each other. Students can earn up to 5 packages of color! Check out the video at the top of the page of what the color will be like. How does my student raise donations? Each student will create one Eagle Color-Thon fundraising page using our Pledgestar fundraising portal. Parents of younger kids will create a fundraising page for each of your children. It’s quick and simple to set up. From your student’s fundraising page, you can enter email addresses or cell phone numbers for your family, friends, neighbors, and co-workers to invite them to pledge donations. Donors can then pledge donations using a credit card. Your fundraising page will also provide a link for sharing on your social media accounts. If your donors want to pay cash or check, please use a donation form and envelope that can be found in the school offices. Also, included in the donation envelopes are digital invite cards. These cards are for your student to use if a donor doesn’t have money at the time but wants to give online. Ask the donor to write their information down on that card so you can send them a digital invite to donate through your fundraising page. What does my student wear to the event? Help your student(s) raise pledges! We also need volunteers to help during the event. If you are interested in volunteering, please send an email to Nicole MacMillan. YES! Not only will this be a fun way for students to get exercise and raise money, but they will also get a chance to earn rewards and prizes! LUNCH IN VICTORY LOFT FOR 1 WEEK. ONE OF THOSE DAYS WILL BE A SPECIAL TREAT SERVED. ALTITUDE JUMP PASSES OR THE JUMPY PLACE PASSES DEPENDING ON YOUR STUDENT’S PREFERENCE. ELEMENTARY PRINCIPALS (MS. MUMME AND MRS. JACOBS) WILL BE COVERED IN SILLY STRING BY 10 ELEMENTARY STUDENTS WHO RAISE THE MOST MONEY! SECONDARY PRINCIPALS (MS. ELMER AND DR. BAZAR) AND THE FOLLOWING TEACHERS WILL DYE THEIR HAIR A CRAZY COLOR! MR. PINKSTON WILL STAND ON THE ELEMENTARY ROOF DRESSED IN A BUNNY SUIT THROWING OUT EASTER TREATS AND MAYBE…JUST MAYBE GET BLASTED IN COLOR! When does the donation window close? Start raising donations TODAY! We will close the donation window on April 18th. The donation form, collection envelope, and donations must be turned in no later than April 18th. 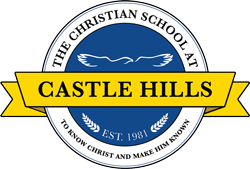 Castle Hills Kindergarten through 12th Grade students only. Yes, if you do not want color in your car, a good option is to lay a towel down. You can also send a change of clothes and shoes with your student to take to school. Can I attend and watch all the fun? Yes, come and enjoy the CRAZY COLOR FUN & MUSIC! Yes it is. The powder contains corn starch, baking soda and food dye. It is also gluten free! For children with Asthma or other respiratory issues, we will be providing masks at the day of the event to prevent the color powder from being inhaled. * We will be providing Color-Thon Sunglasses for every student to protect their eyes during the event and be able take home with them! I have a question...who do I contact? Please send an email to Nicole MacMillan HERE.